If I was asked what actors I’d like to see curate their own film festival, Michael Cera would be right at the top of my list. When invited by The Criterion Collection to name some of his favorite titles granted a pristine release by their company, Cera cited Abbas Kiarostami’s 1990 masterpiece, “Close-Up,” as a personal favorite. The picture centers on a devout film lover who poses as his favorite director in order to convince the filmmaker’s family to reenact moments from their lives on camera. The same could be said of Cera’s performances. His portrayal of sweetly neurotic teenagers in films such as Greg Mottola’s “Superbad” and Jason Reitman’s “Juno”—both of which celebrate their tenth anniversaries this year—was so authentic that it caused many viewers to wonder whether Cera was merely playing himself. Only people with no experience in acting would believe that portraying oneself is an easier task than inhabiting the skin of one’s polar opposite. Regardless of how close these characters may have been to Cera’s own personality, what he crafted in those earlier pictures was a brilliantly nuanced comic persona that instantly made him my favorite actor of my generation. Watching his character of Evan in “Superbad” was akin to watching myself in high school, from his deadpan warbling of “These Eyes” to the uproariously awkward way he sings, “Byyye,” to his crush while scurrying down the hallway. In the years following “Superbad,” the name “Michael Cera” was often used as a term of endearment to describe young neurotic types, enabling people who would usually be ostracized by their peer groups to feel more accepted. Looking back on my own high school years, I realized that I would often affect neurotic behavior in order to amuse—and hopefully gain the friendship of—people my age. 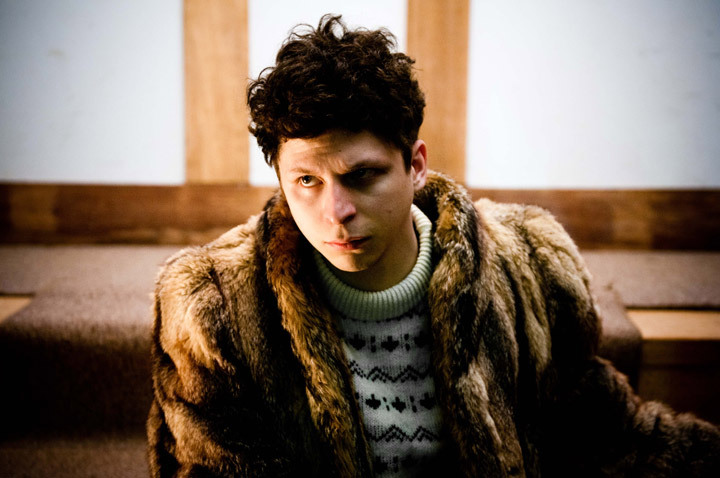 There were always hints embedded in Cera’s performances that his eccentricities may have been designed as a sort of protective shield, epitomized by the line of his character Paulie in “Juno” after he’s praised for being cool without ever seeming to try. “I try really hard, actually,” Paulie confesses. Cera’s latest character could certainly be included in that category. He’s one of several people featured in the parallel narratives interwoven throughout “Person to Person,” a charming ensemble comedy set in New York City. It marks the second directorial feature of Dustin Guy Defa, a prolific filmmaker with several shorts and acting credits to his name. As the smitten boss of a newly hired investigative reporter (Abbi Jacobson), Cera’s character of Phil can be extremely funny, but his quirks thinly mask an underlying abundance of desperation. Cera also noted how his character’s plight isn’t all that uncommon in the Big Apple. Another highlight in the cast of “Person to Person” is the bitingly witty Tavi Gevinson as a young woman whose budding infatuation threatens to dismantle her misanthropic tendencies. Though she and Cera share no scenes in the film, they acted opposite each other onstage during the 2014 Broadway run of Kenneth Lonergan’s play, This Is Our Youth. During his 2012 appearance on Marc Maron’s WTF podcast, Cera expressed his desire to one day make an “alienating film” in the vein of Michael Haneke. A year later, he starred in Janicza Bravo’s short film, “Gregory Go Boom,” a seriocomic portrait of a lonely paraplegic man that ends on a note so shockingly bleak, it could even cause Haneke to shudder. Now Cera and Bravo have re-teamed for her feature directorial debut, “Lemon,” a funnier but no less painful comedy starring Bravo’s husband, Brett Gelman, as Isaac, a pompous acting coach whose life spirals out of control. Rather than follow the traditional Hollywood career trajectory of accepting major roles in tentpole movies, Cera opts for seeking out filmmakers whose work fascinates him. After falling in love with Sebastián Silva’s 2009 Chilean gem, “The Maid,” Cera flew to Chile and began an extended collaboration with the director that was as immersive as it was surprising. “Crystal Fairy” was made during the production delays for Silva and Cera’s project that they had initially planned to make, 2013’s criminally overlooked psychological thriller, “Magic Magic.” Cera’s performance as Brink, a closeted sadist with a penchant for torturing women, was not only a startling change of pace, but a splendidly creepy tour de force. He spent a large portion of his time with Silva’s family learning Spanish for the picture. This performance offers yet another example of the impeccable comedic instincts and timing that Cera perfected in his career-launching role as George-Michael Bluth on Mitchell Hurwitz’s original three seasons of “Arrested Development” (2003-06). With “Person to Person” and “Lemon” soon arriving in theaters and online (“Person to Person” on July 28th, “Lemon” on August 18th), moviegoers will have the pleasure of watching Cera continue to stretch himself in roles that never cease to mesmerize, challenge and elicit explosive guffaws. Next Article: Comic-Con 2017: "Sigmund and the Sea Monsters," "Danger & Eggs," "Niko and the Sword of Light" Previous Article: That Feeling of Connection: Gillian Robespierre and Elisabeth Holm on "Landline"